If you are this photographer - welcome - and please use the Submission guidelines to make sure we get everything right. British art critic, writer, social reformer, artist and occasional amateur photographer. References are available for subscribers.There is so much more to explore when you subscribe. If you are related to this photographer and interested in tracking down your extended family we can place a note here for you to help. It is free and you would be amazed who gets in touch. Visual indexes for this photographer are available for subscribers.There is so much more to explore when you subscribe. "[…] it is just this lack of conclusiveness in Ruskin's art, its tentative, explorative, and experimental character, that gives it such interest to the modern eye […]"
"Had I supposed myself to possess the power of becoming a painter, I should have devoted every available hour of my life to its cultivation, and never have written a line. But the power of drawing, with useful accuracy, objects which will remain quiet to be drawn, is within every one's reach who will pay the price of care, time, and exertion. This price I have paid; and I trust, therefore, that the drawings which either now, or at any future period, I may lay before the public, will not be found deficient in such ordinary draughtsmanship as may be necessary to the fulfilment of their purposes; while, on the other hand, they will never lay claim to any higher merit than that of faithful studies. I never draw architecture in outline, nor unless I can make perfect notes of the forms of its shadows, and foci of its lights. In completing studies of this kind, it has always seemed to me, that the most expressive and truthful effects were to be obtained (at least when the subject presented little variation of distances) by bold Rembrandtism ; that is to say, by the sacrifice of details in the shadowed parts, in order that greater depth of tone might be afforded on the lights. Studies made on such a system, if successful, resemble daguerreotypes; and those which I have hitherto published, both in the 'Seven Lamps', and in the text of the present work, have been mistaken by several persons for copies of them. Had they been so, I should certainly not have stated them to be copies of my own drawings; but I have used the help of the daguerreeotype without scruple in completing many of the mezzotinted subjects for the present series; and I much regret that artists in general do not think it worth their while to perpetuate some of the beautiful effects which the daguerreotype alone can seize.". As is well known thanks to the letter to his father dated October 7, 1845, Ruskin, in search of a means - to be attached to key direct observation - to improve its data collection for the study of architecture, buy for the first time daguerreotypes (twenty plates by a 'French') in 1845 in Venice. In 1846, he states in another letter that considers the daguerreotypes "more valid than any sketch in terms of information" and therefore the sketches "merely" as "memoranda". In 1849 he returned to Venice after purchasing a daguerreian camera to work together with the secretary-servant-photographer John 'George' Hobbes to the project of The Stones of Venice. Many other significant reflections and evaluations on photography and on the relationship between art and photography, essentially marked by a dualism of positive-negative attitude towards photography, are detectable in the vast oeuvre of Ruskin. An important contribution to the reconstruction of the courses of such dualism has been offered by Michael Harvey in 1984 ("Ruskin and Photography", The Oxford Art Journal, 7, 1985, 2, pp. 25-33). In terms of the study of the role and importance of the daguerreotype in the work of Ruskin in the study of architecture are important the contributions by Wolfgang Kemp ("Architektur-Aufnahme am Übergang von der Zeichnung zur Fotografie – das Beispiel Ruskin", Marburger Jahrbuch für Kunstwissenschaft, 20, 1981, pp. 55-62) and Paolo Costantini ("Ruskin e il dagherrotipo", in I dagherrotipi della collezione Ruskin, edited by P. Costantini, and I. Zannier, Venice-Florence 1986, p. 11-20). We still lack, however, an in-depth reconstructive investigation of the creative processes that lead to specific graphic or pictorial works even in the case of Ruskin's historiography. This is not covered in the recent exhibition catalogues addressing the relationship between art and photography or rather between the artists and photography (I Macchiaioli e la fotografia, exhibition catalog, edited by M. Maffioli, with S. and N. Marchioni, Florence 2008; Voir l'Italie et mourir. Photographie et peinture dans l'Italie du XIXe siècle, catalogue edited by G. Cogeval and U. Pohlmann, Paris 2009, The Pre-Raphaelite Lens: British Photography and Painting, 1848-1875, catalogue edited by D. Waggoner, Washington-Paris 2010) which essentially have been confined to bring together photographs and works of art including paintings, prints and drawings. Ruskin's case - not surprisingly mentioned by Aaron Schaaf (Art and Photography, London 1968) is particularly interesting given the depth and poignancy of his commitment to the art of drawing as a process in the investigation of reality. The monograph by Paul H. Walton (The Drawings of John Ruskin, Oxford 1972) remains a very solid cornerstone for the study of Ruskin's drawing's art but provides sporadic and insufficient attention to the process of making drawings or to the use of tools such as camera lucida or camera obscura and also to the relationship with photography. The photograph came before or after the pertinent drawing? and what are the discrepancies and the reasons for them? The works certainly derived from daguerreotypes are only illustrative drawings of his texts on the art or even - which seems less likely – "delight drawings"? In the case of derivation of drawings from the photographs, what were the methods used (formats of photography and drawing; mode of transcription; fidelity of transcription or not, etc..)? In developments of the art of drawing as an investigation of reality, what role and what relationship they have - in Ruskin fundamental polarity between truth and emotion (imagination) or between Realism of Pre-Raphaelites and Impressionism of Turner - the drawing from life, the sketch , the watercolor, the transcript (or copy) in pen or pencil or etching from the sketch from life or from photography to illustrate his texts? Some of the daguerreotypes in the Ruskin collection are colored by hand; what meaning must we give to that fact? How much photography has contributed to the trend - continue from the beginning, even before the advent of photography - in the graphic work of Ruskin to alternate subjects taken over at close range and with high magnification or landscapes taken over with a very wide angle? And in this regard is possible that Ruskin has made use of camera obscura with long or short focal length lenses? Since it's impossible to me to realize a philological research in the Ruskin's archives and on the Ruskin's works and to answer all these questions, here I confine myself to some notations. Let's examine one of the views of Freiburg, of which are preserved the drawing in ink, watercolor and gouache (22.5 x 28.8 cm, British Museum, London) and the daguerreotype (11.5 x 15.1 cm, K. & J. Jacobson Collection) (Figs. 1, 2). J. Ruskin, Freiburg, partial bird’s-eye view to the rue de la Palme, taken by a tower of the city walls, 1859, ink, watercolor, gouache, 22.5 x 28.8 cm, London, British Museum. Manuscript at the bottom, right, "Fribourg / Sketch for / etchings of Swiss / towns. 1859/Signed (1879) JRuskin”. Freiburg, partial bird’s-eye view, 1859, daguerreotype of the Ruskin’s collection, 11.5 x 15.1 cm, Collection K. & J. Jacobson. Freiburg, partial bird’s-eye view, 1859, daguerreotype of the Ruskin’s collection, 11.5 x 15 cm, Bembridge, Isle of Wight, Ruskin Galleries, Bembridge School. The view is taken by one of the towers of the city walls, and shows the rue de la Palme, the Fontaine de la Fidélité at the bridge on the Gotteron, and the Pont de Berne on the Sarine. Diane Waggoner writes: "Ruskin had a daguerreotype of a bird's-eye view taken of the town and translated the visual information from this image to a watercolor" (op. cit., P. 5, 6). The same argument is stated in the comment of the official website of The British Museum. 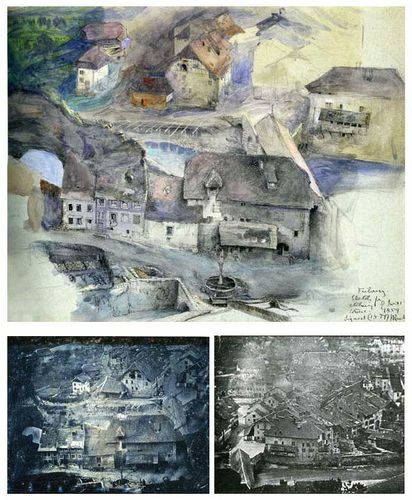 The inscription at the bottom of the watercolor: "Fribourg/ Sketch for/ etchings of Swiss/ towns. 1859/ Signed (1879) JRuskin" is not discussed in either the Waggoner's text nor in that of the museum curator. 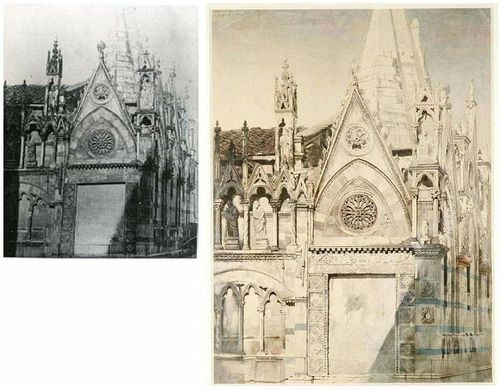 An analysis and comparison of the daguerreotype and the watercolor shows that contrary to what Waggoner asserts the drawing is not derived by transcription from the daguerreotype. The bird's-eye watercolor view is drawn from a point of view slightly left-shifted compared to that from which the daguerreotype was taken; see the perspectives of 1) the arch of the covered section of the Gotteron stream in foreground to the lower margin; 2) of the roofs of the houses in the foreground at the bottom; 3) of the Pont de Berne on the Sarine on the right; 4) of the houses on the opposite bank of the Sarine, on the background. In the watercolor appear quite a few details not found in the daguerreotype: in the nearest foreground, at the bottom, from left to right: 1) the design of low terraced gardens in the left margin, 2) the arch of the covered section of the Gotteron stream, 3) the rectangular basin juxtaposed with the circular fountain, in the center; in the foreground, in the sequence of front elevations of houses built between Gotteron and Sarine: 1) the lintels of the windows on the ground floor of the first house on the left, 2) many details of the openings (compartments, items placed on the breast, walled up arch ), 3) objects in the fronts of the houses (such as the stellar object set down on the ground on the left of the fourth house); details in the right edge of the picture, wider in the watercolor coming to include the big house on the edge of the river. This big house is evident in the foreground in another daguerreotype of the Ruskin's collection (Fig. 3), taken from the same point of view of the one previously examined and contiguous to it, in such a way that the two daguerreotypes form, if pushed together, a long horizontal panoramic view. Conversely, the design of the houses on the background appears in the watercolor more simplified than in the daguerreotype. Even the watercolor of a bird's-eye view of Freiburg with in the foreground a stretch of city walls is taken from a point of view close but not identical to that of the daguerreotype of the detail of a tower of the same section of wall (Figs. 4, 5). J. Ruskin, Freiburg, partial bird’s-eye view with in the foreground a stretch of city walls, 1859, pencil, watercolor, gouache, 28 x 29.6 cm, Bembridge, Isle of Wight, Ruskin Galleries, Bembridge School. Manuscript at the bottom, right: "Study for etching of Fribourg / (in Switz). 1856. Signed 1874. JRuskin". Freiburg, tower of the city walls, daguerreotype of the Ruskin’s collection, 1856?, Bembridge, Isle of Wight, Ruskin Galleries, Bembridge School. According to the testimony of Ruskin another view of Freiburg, one of the crenellated walls of the city with two towers was designed by Ruskin before to take it in a daguerreotype. He writes in Modern Painters, Part V, ch. 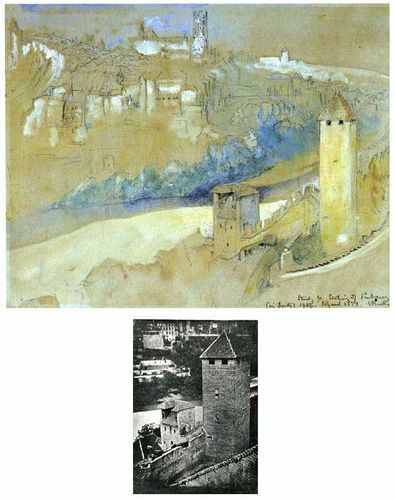 2, § 23): "The other day I sketched hastily the towers of the Swiss Fribourg from the Hôtel de Zähringen [...]. I have engraved the sketch and I reproduce it in the Table 26 adding a few details, and exaggerating the exaggerations. [...] The next day [...] I daguerreotyped the towers and this unexaggerated statement, with its details properly painted, would not only be the more right, but infinitely the grander of the two. But the first sketch nevertheless conveys, in some respect, a truer idea of Fribourg than the other [...]. For instance, the wall going up behind the main tower is seen in my drawing to bend very distinctly, following the different slopes of the hill. In the daguerreotype this bend is hardly perceptible." (Figs. 8-10). J. Ruskin, The walls of Fribourg, 1854, watercolor, 28.4 x 20.9 cm, London, The British Museum. The city walls of Freiburg, previous drawing (Fig. 8) reproduced in engraving by J. C. Armytage, in J. Ruskin, Modern Painters, V, 1860, ch. 2, pl. 26. The city walls of Freiburg, daguerreotype taken after the drawing (fig. 8) and reproduced in engraving in Modern Painters, V, 1860, ch. 3, pi. 27. Let us now examine the case of a set of documents relating to Lucca. The daguerreotypes taken in Lucca - seven, having as its object the monumental architecture of San Michele, of the Duomo and of Palazzo Guinigi - are being collected by Ruskin as documents to be used for more precise studies, as memoranda to add to the personal sketches and watercolors. Lucca, the left side of the facade of San Michele, 1846, daguerreotype commissioned by John Ruskin, 9.5 x 7 cm, Bembridge, Isle of Wight, Ruskin Galleries, Bembridge School. Whole. Lucca, the left side of the facade of San Michele, 1846, daguerreotype commissioned by John Ruskin, 9.5 x 7 cm, Bembridge, Isle of Wight, Ruskin Galleries, Bembridge School. Detail. J. Ruskin, Lucca, detail of the facade of San Michele, 1846, watercolor, 40.7 x 24.6 cm, Oxford, Ashmolean Museum. Lucca, detail of the facade of San Michele, tracing etching on steel, 25.6 x 17.8 cm, Table VI in J. Ruskin, The Seven Lamps of Architecture, London 1849. During his stay in the Tuscan town in 1846 Ruskin did order to realize a daguerreotype of the left side of the facade of San Michele (Figs. 11, 12). At the same time he drew from life a watercolor of a portion of that part of the facade (Fig. 13), from which he derived in 1848-1849 the tracing engraved detail for Table VI of The Seven Lamps of Architecture (London, 1849) (Fig. 14). The daguerreotype image is obviously reversed from right to left from the original perspective. By copying the detail of his watercolors for the tracing engraving Ruskin does not care about the fact that the printed image appears reversed with respect to the truth. In the execution of the watercolor he draws the seventh column, decorated (the theory of fighting animal), in the place of the third, flat (see Figs. 12 and 13). 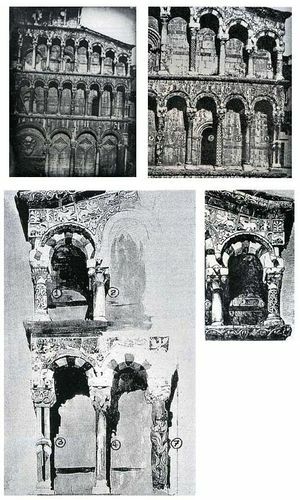 These documents demonstrate the ambivalent attitude of Ruskin: on the one hand, his intention of deepening of the detail that causes it to cut out the detail for the incision and on the other his taste for the picturesque that in the execution of the watercolor leads him to the ideological false (or poetic license) of the exchange of columns. 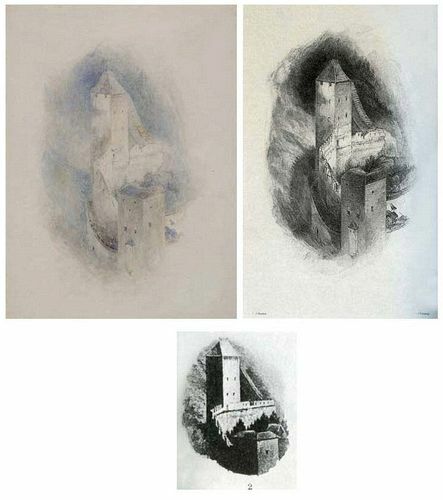 Having Ruskin derived the illustration from the watercolor made on site, the detail is foreshortened in perspective from below. If instead he had copied the daguerreotype the perspective deformation would be reduced because the daguerreotype was taken from a higher vantage point than that of the watercolor. Pisa, Santa Maria della Spina, 1846, daguerreotype of the Ruskin’s collection, 14.8 x 11 cm, Bembridge, Isle of Wight, Ruskin Galleries, Bembridge School. J. Ruskin, Pisa, Santa Maria della Spina, ca. 1847, watercolor, ink and pencil, 49.5 x 36.5 cm, Sheffield, Guild of St George, The Ruskin Collection. Different is the case of the detail view of Santa Maria della Spina at Pisa comprising part of the south prospectus and the foreshortened east one. Here the watercolor has been copied, much larger in size, from daguerreotype (Figs. 15, 16). This is evident from a comparison of the two images and indeed is testified by Ruskin himself, who writes in Fors Clavigera (XXVII, 349) to have copied the daguerreotype "so that the observers were not disturbed by the reflection". It should be noted that among the known daguerreotypes of Pisa collected by Ruskin the one of the southeast corner of the Spina is the only of a detail and the more potentially picturesque. The transcription is literal, including the cast shadow at the right side of the image and the iron fence cut at the lower margin; but the eastern façade of the building is cut to the right margin and is included for daguerreotype in full. The watercolor shows a tendency to monochrome with a range of colors and vibrancy far more limited than the watercolors from life. A report published in the Athenaeum (February 20, 1847) shows that in the exhibition organized by the Graphic Society in February 1847 drawings and watercolors by Ruskin were exposed "in juxtaposition to" a "series of daguerreotype views of many of Italian religious buildings' (cf. Ruskin e la Toscana, exhibition catalogue edited by Jeanne Clegg and Paul Tucker, Lucca 1992, p. 55). Notwithstanding the need to cover by philological investigations the whole Ruskin's work, the cases examined confirm that the relationship drawing-photography is complex and articulate and lead to the conclusion that photography has had a particular value for Ruskin and importance as a tool in the visual and optical process of survey and of exaltation of the truth and seem to indicate - as indeed it was logical considering his ideology and his creativity - that rarely works of artistic self- such as "delight drawings" have been derived by him by copying from photographs.